JACOB REES-MOGG quickly pointed out to a radio caller that Brits had already “had a vote” on leaving the European Union after a caller demanded a referendum on the final deal. Leading Brexit supporter and Conservative MP Mr Rees-Mogg outlined the problems that would arise if the UK had another vote on cutting ties with Brussels. The Chairman of the European Research Group also claimed the European Union have demanded member states vote again when a country makes a decision, and the outcome is not what they want. 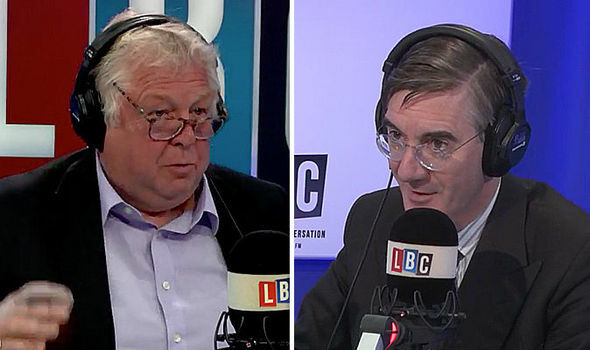 A caller, known as Anthony, told Mr Rees-Mogg that Brexit was one of the most important issues of our time and should be decided by a vote on the final deal. LBC host Nick Ferrari pointed out the British people had not had a vote on the final deal. The Brexiteer added: “No, but they had a vote, 17.4million people. The biggest exercise in British democratic history – to leave the European Union. “If you give people the second vote, what is that vote going to be about? The presenter explained that could cause issues if members of the British public like on an aspect of the deal, but not other parts. The Brexit supporter replied: “That’s true, it would be a multifaceted deal, and you would have to offer the people the option of leaving without a deal as well as rejoining it becomes a completely different discussion. “It’s worth bearing in mind there have been three votes on the referendum. First of all the Conservatives had it in their 2015 manifesto saying there would be a referendum and the choice would be given to the British people. “Then there was the referendum itself. Then at the last election, both the Labour Party and the Conservative Party said they would respect the referendum result. That’s the third vote. “It’s quite clear that people have voted to support leaving the European Union. It comes as the Prime Minister is set to try to fight off House of Lords amendments this week to the Withdrawal Bill. The marathon debating sessions will take place on June 12 and June 13 when the Commons debates the amendments, which threaten to keep the UK in the customs union and the European Economic Area.